Offering places and moments to explore and to grow in faith in the power that is at the heart of life is the objective of our educational ministries. Providing avenues for discussion and examination of complex issues, learning and interpreting Scripture and the Church’s teaching for our own lives, and providing the building blocks of faith translate to programs, classes, workshops, retreats. Built around the academic year, these opportunities are offered on Sunday mornings and on various Sunday evenings, on weekdays and weekday evenings. We have three offerings for adults on Sunday morning during the Sunday School hour of 9:30 – 10:15 a.m. The Faith Forum will be one of two weekly opportunities this fall for adults to engage in Christian education. The Faith Forum will offer a diverse range of topics and opportunities to explore faith—in our lives and in the world. The Family Forum will offer opportunities for attendees to participate in discussions on the various topics of faith practiced as parents and families. This fall join us in the Choir Room for a lively discussion of Vintage Saints & Sinners by Karen Wright Marsh. Please go to this Sign Up Genius link to view more information about what we’ve got going on! https://www.signupgenius.com/go/4090f4facab2ca2fe3-join. A walk through the church, the Episcopal History: Come and eavesdrop on a conversation between Hayne Cope and Jason Cheek as they explore the history of the Episcopal church. You are welcome to sit back and listen or actively engage as they follow a chronological timeline and discuss how the growth of the Episcopal church intersects history and the Bible. If you join them you can be sure to be intrigued and entertained. All are welcome and you can come and go any Sunday. They plan to follow a schedule of topics but make no promises. If something peaks their interest they will likely take a detour. They will meet in the Chapel at 9:30 a.m. unless posted otherwise beginning Sunday, September 16. Just know they will always make room for you. Women’s Bible Study – This group meets the second Monday of each month in the Parlor to explore and wrestle with what it means to live our lives as women of faith. A book is chosen as a stepping off point for discussion and the group is open to women of all ages and stages. 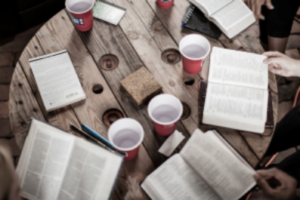 Education for Ministry (EfM) A small group of 6 to 12 adults meet weekly on Wednesday nights throughout the school year for theological reflection and conversation. EfM is the premier adult Christian formation program in the Episcopal Church. There are more than 33,000 lay persons who are EfM graduates throughout the Church. Participating in Education for Ministry requires a commitment to regularly attend the weekly meetings, and to read weekly lessons in Biblical studies which helps enrich and deepen the group’s conversations. No prior Biblical study is required. The cost of participation is $350. Open enrollment begins now so contact Fr. Furman or Meta Armstrong to join up! JustFaith‘s signature program involves reading contemporary books on a variety of topics, and also participating in local, field trip experiences to enhance our awareness of the challenges endured by those whose claim upon “liberty and justice for all” is most tenuous. The regular, small group meeting is tentatively scheduled for Thursday nights, beginning in September. Please email Fr. Furman to express interest in this group or ask further questions. Both groups will be limited to 12 participants. Spots are limited! Email ASAP! Engaging Spirituality comprises twenty-one 2½-hour sessions. Every session includes Centering Prayer, guided meditation, lectio divina (sacred reading), dialogue, and the deepening of relationships. Participants read five spiritual texts, maintain a prayer journal, reflect on the wisdom of 25 spiritual teachers, and view three inspiring DVDs. Each of the three phases of the course is marked by a retreat or immersion experience. This includes a one-day Immersion and a one-day Justice Pilgrimage to local sites. This small group meeting is tentatively scheduled for Thursday mornings, beginning in September. Please email Alice Baird to express interest in this group or ask further questions. Alice Baird and Mary Mills will co-facilitate. Weekly Bible Study with Fr. Furman Fr. Furman holds a weekly Bible study on Thursday afternoons at 3:30 pm in the parlor. No prior knowledge or experience with the Bible is necessary. Come enjoy the fellowship of a group that enjoys learning together in a “no-pressure” environment as we look closely at what the Scriptures reveal to us about life in the earliest congregations! The Women’s Bible Study group will resume on Monday, January 14 at 7 p.m. Join us in the parlor as we look at the lives of ten bad girls from the Bible. We will be using Bad Girls of the Bible: And What We Can Learn from Them by Liz Curtis Higgs. Higgs begins each chapter with a fictional modern-day account of the Bad Girl then gives commentary as she looks at the Scriptural story verse by verse. Each week we will focus on one Bad Girl so please feel free to join us as your schedule allows. The book can be found locally and online. The cover art has changed with revisions and any edition is fine. To get a feel of the author’s style and more information visit https://www.lizcurtishiggs.com/books/bad-girls-bible/ . Please contact Jan Rhodes if cost is a concern or you have any questions. Discovery Weekend focuses on hospitality and welcome to newcomers, as well as an opportunity for lifelong Episcopalians, as we take a fresh look at the things we believe about God, about the Bible, about the Church and about ourselves. This class is open to everyone, and no prior experience or knowledge is required. We will use the basic outline of the faith found in the Book of Common Prayer to guide our class. This class will serve as the preparation for adults who would like to be confirmed or received into the Episcopal Church when our Bishop visits. Call the church (268-7280) for the date of the next Discovery Weekend.